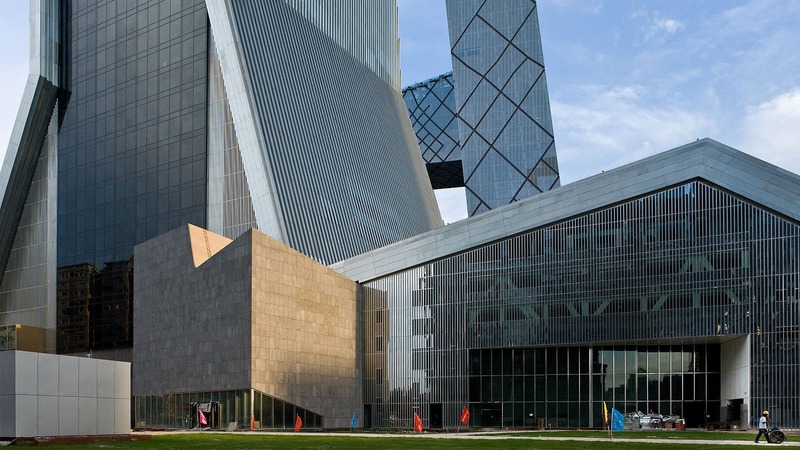 The Television Cultural Center establishes a more informal quality adjacent to the strong architectural figure of CCTV. 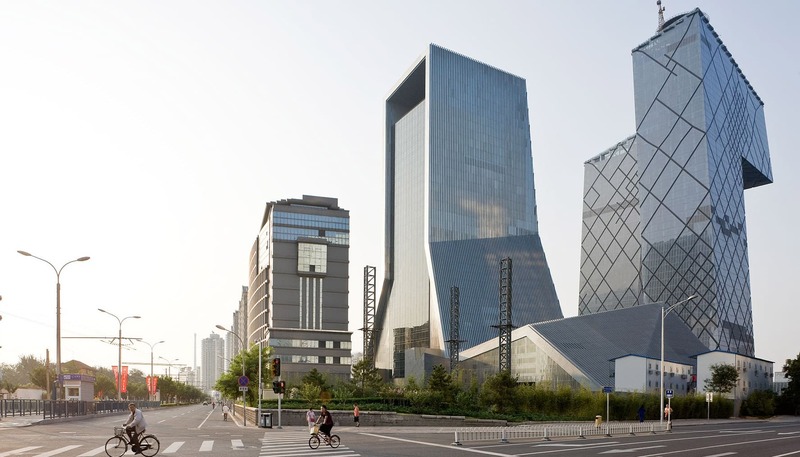 By assembling the varied and diverse function areas required for the freely accessible public program into one building, the Television Cultural Centre establishes a more informal quality adjacent to the strong architectural figure of CCTV. Multiple functions – a 1,500 seat theatre, digital cinemas, recording studios, press conference and exhibition space, and a five-star hotel with ballroom, conference rooms, and spa – are stacked to form an accumulation of structurally independent volumes. 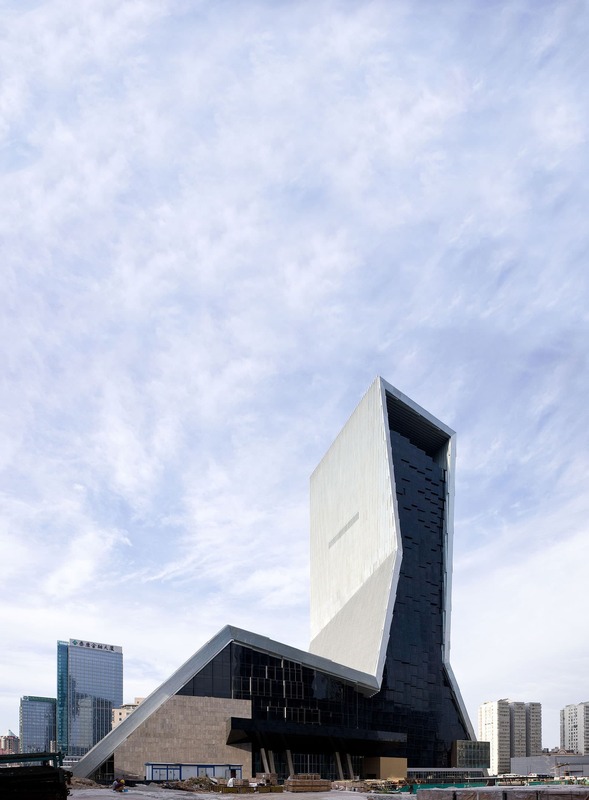 A continuous skin envelopes this assemblage – starting from the ground up, the skin extends upwards to form the angular sloping roof of the long podium, then becoming the vertical façade of the tower, wrapping over the top of the building and down the other side – defining the actual shape of the essentially shapeless building; and freezing a moment of apparent instability into an icon in its own right. 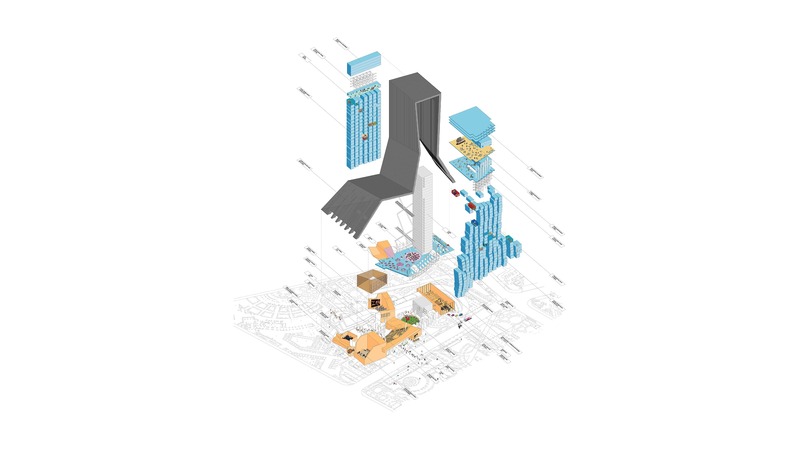 The design creates an urban microcosm by replicating the looseness of the surrounding urban fabric – the majority of program distributed on the first four levels, the foyer, lobbies, theatre, ballroom and hotel drop-off can be understood as plazas or public spaces in a city. TVCC’s theatre seats 1,500 people all on a single gigantic floating balcony. This configuration undoes the traditional separation of the audience into stalls, balconies, and boxes, and liberates the entire ground – providing a continuous floor space to extend from the backstage area to the foyer without interruption. This allows maximum flexibility for the stage to be enlarged at will, TV cameras to move freely, temporary seating to be installed, and large-scale processional events to pass through the theatre. 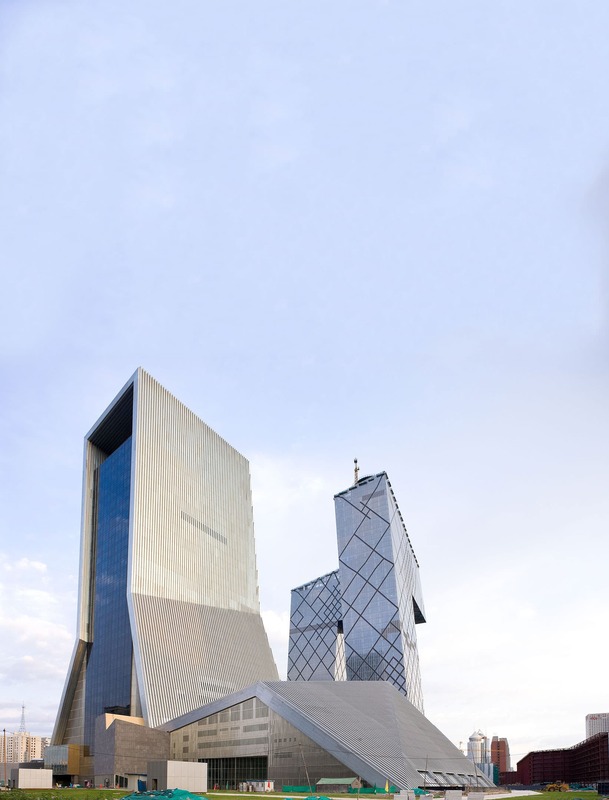 The hotel is located in the tower and is connected to the podium via a shuttle elevator to the fifth floor, where a 100m high atrium begins, rising above the lobby. Check-in area, restaurants, bars, shops, and access to the swimming pool and spa, as well as other public functions such as a suspended conference center are all accommodated on the elevated lobby level. 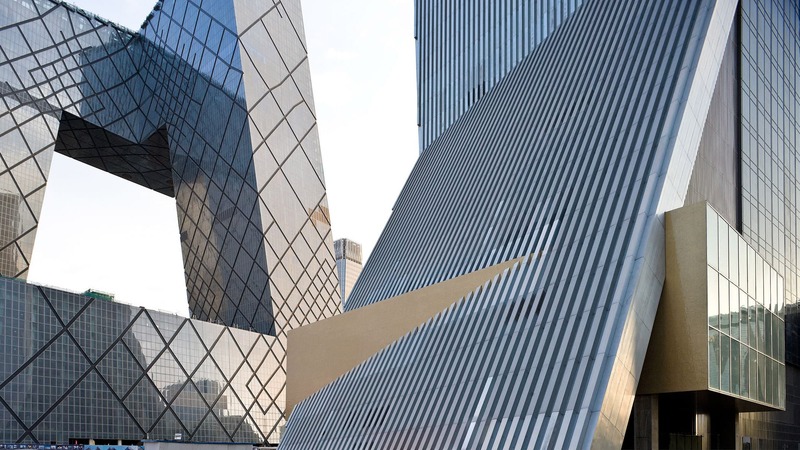 The atrium is surrounded by 300 hotel rooms, which on the south side are arranged in an irregular pixilated pattern that juts from the façade facing CCTV and E8 road, while the north-facing façade remains flat and consistent. The top of the hotel offers spectacular views of the city from two restaurants and a sky bar.